Sam Madden is a co-founder of PocketSuite. With Google, Facebook And Nextdoor, What’s Next For Lead Generation? Can Entrepreneurs Succeed In Today’s On-Demand World? On the heels of Homejoy’s failure, the fundamental “on-demand marketplace” model has come into question by investors, the media and even consumers. That questioning is very relevant, as there has been an overload of VC money that has been injected in the on-demand service platform space over the past few years ($4 billion-plus in 2014). From an investor’s perspective, the fundamentals make sense — scalable products, revenue-generating from Day 1, intrinsic viral effects. Homejoy wasn’t any different. Even Homejoy’s mission statement was clear and admirable — to give homeowners convenient and quality access to home cleaning (later expanding to other home-service verticals), all the while giving service professionals (“pros”) real work to help them become entrepreneurs. Great model, great mission — a venture well worth $40 million in funding. But Homejoy failed. The headline reasons for failure were the worker misclassification lawsuits. That is, Homejoy classified the pros in its network as “contractors” from a labor perspective. However numerous lawsuits were eventually filed by pros arguing that they should actually be “employees,” and have the same wage, benefits and other rights associated with employee classification. This proposed change would have increased Homejoy’s cost base significantly, and changed the company’s profitability profile completely. The fundamental “on-demand marketplace” model has come into question by investors, the media and even consumers. Some also say that the company grew too fast, expanding to Canada and Europe too early. There indeed are significant up-front marketing costs incurred entering any local market, so fast expansion would result in a severe cash burn. However, if there is a clear path to eventual positive ROI, then investors should be OK with the expansion plans, as the company would eventually become cash-flow positive. The truth is, Homejoy’s profitability profile was not viable, even with their pros classified as contractors, and even in cities that were deemed core. The reason for this boils down to the fundamental market the company served. The home services market is huge. It’s estimated to be between $400-800 billion in size — a market of that size gets a lot of attention from entrepreneurs and investors. But fundamentally, it has very different dynamics from other service markets (i.e., transportation, delivery, freelance writing, etc.). Your home is your domain. It’s your safe space. You sleep there, you eat there, your loved ones live there. As a result, an incredible amount of trust is needed whenever someone comes in or around your home. When it comes to hiring for home services, assurance and quality are heavily scrutinized: You need to feel safe to let a burly plumber into your home; there needs to be a consistent level of quality to have the same cleaner come each month; you need to trust your pet sitter to leave them your house keys. And when you find those trusted, quality pros, the last thing you want to do is lose them. These client-pro relationships can last decades; many of these services are recurring, providing much-needed visibility for the client (“Is my home the way I want it to be at all times?”) and the pro (“How much money will I know I’ll be making this month?”). Where Homejoy succeeded was making it incredibly convenient for the homeowner to get someone in the door, all the while giving a first-time and willing-and-able pro work right off the bat. 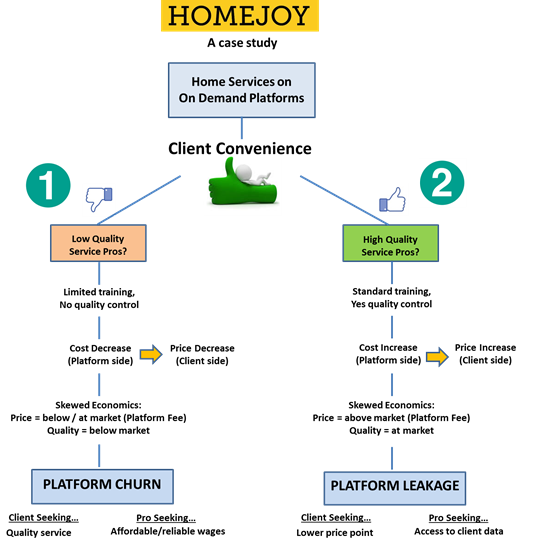 The initial friction on both sides of the equation was basically eliminated by using Homejoy. Where everything breaks down is quality versus cost. For an on-demand marketplace to succeed in home services specifically, there needs to be a specialized focus on either extremely high-quality service to warrant a platform fee, or quick and easy services done on the cheap. Homejoy was structured as a contractor-for-hire business, with limited training and quality assurance needed for its pros. That structure delivered competitive pricing for clients — which on paper is great for the homeowner. However, because Homejoy acted as a platform “middle man,” taking a 25 percent cut of the transaction, the wage economics for pros did not make sense. Thus, this attracted young, inexperienced and low-quality pro labor (at times even homeless people), leading to inconsistent and lower-quality work. This mix doesn’t quite cut it for the average homeowner who wants a spotless home, thus leading to platform churn. The other option for Homejoy was to shift to more of an employee model. That is, train their pros, so as to ensure some sort of level of quality to warrant market wages and benefits, which could then be passed through to the customer. The issue here is if Homejoy wanted to preserve its transaction margin, homeowners would be paying above market. So, above-market pricing for market-quality cleaning. This structure increases the chances of what we call “platform leakage” — a client finding a quality pro and taking them offline to ensure quick and easy access to their quality services in the future, for less. The home services market fundamentally is more prone to leakage as it is a high-touch, trust-heavy model, with a recurring type of client-pro relationship. It wasn’t all bad for homeowners. Homejoy did match some skilled pros with homeowners, driving them to form real business relationships. The issue was these relationships were typically taken “offline” (i.e., platform leakage). Once you (as the homeowner) find a home services pro you like and trust, there isn’t much upside for going back to the well to find a new one — you never know if you’ll find someone good enough! There was a lot of leakage driven by homeowners who, if they found a quality cleaner, would hire them offline, where they wouldn’t pay any more for services (and even less at times). Sure, Homejoy was a convenient platform, but trust and quality trumped this convenient technology. And for the pro, going offline immediately boosts their wages (eliminating the middle man), creates a recurring cash-flow stream and ensures valuable client data is now owned by them (not a third-party platform). The pro’s risk, of course, would be getting kicked off of Homejoy. But the reality was their wages were unlivable to the point that taking the risk was worth it. And with the client driving most of this offline leakage, the risk of getting caught was miniscule — who’s going to rat? For all those homeowners who had bad experiences on Homejoy, Plan B options were abundant. The myriad local marketplaces popping up recently is almost hard to believe. Many different models of searching and finding the right service pros exist — Yelp, Thumbtack, Angie’s List to name few — all focused on different verticals, geographies, user experiences, etc. So, if a homeowner wants a convenient and quality experience in finding a new cleaner, there are many competitive options. And unlike Homejoy, many of these models are more scalable because they provide liquidity to the market by supplying pros directly to clients, letting them work together, without preventing the direct (and important) relationship (one reason why Thumbtack in particular has been seeing such success). Full-service on-demand platforms have been seeing success among more commoditized types of services. At the same time, these marketplace models face similar issues around leakage within the home-services market in particular. As soon as you find that cleaner, that dog walker, that landscaper who’s right for you, you want them in your pocket, at your disposal at all times, without needing to go through a searching-platform process again. And for the pros, they clearly know how valuable a recurring client is to them. Full-service on-demand platforms have been seeing success among more commoditized types of services — service industries like transportation (Uber), food delivery (Instacart), shipping (Shyp) and others. Many of these on-demand platforms are succeeding because the clients don’t necessarily need a huge amount of trust in the pro, and the deviation in quality of the service isn’t as large. Granted, similar legal issues exist around employee versus contractor classifications, but many of these companies are able to cost-effectively deal with these issues without being forced to completely shut down operations. Their fundamental models are working;, now it’s a matter of managing future margins. It’s clear how and why Homejoy failed. The company took a very bold step in interjecting powerful technology into the client-pro relationship of the vast home-services landscape. The nuance and convenience of the company’s technology shot them out of the gate strong, but that same technology led to their eventual demise as, over the long term, the on-demand model simply doesn’t work for such a uniquely high-touch market.